The annual Tubachristmas will be held in Manhattan, KS, on Saturday December 8, 2018. Tubachristmas is that special time of the year when persons who play the most noble of all instruments, the tuba, euphonium, or baritone horn, get together to play Christmas carols for the public. It happens across the nation from late November until Christmas. The Manhattan Tubachristmas has been held here for over twenty-five years!! You, your students, and fellow musicians are invited to participate. REGISTRATION: 12:30 P.M. – 1:00 P.M. In the Kansas State University McCain Auditorium, room 201. NOTE THAT THE REHEARSAL IS NOT IN THE SAME PLACE AS THE PERFORMANCE. REHEARSAL: 1:00 to 2:15 p.m. in room 201, McCain Auditorium. We will get in our cars and drive down to the mall after rehearsal for the performance. COST: Registration $10.00, includes Tubachristmas button. If you wish, you may decorate your instrument in a seasonal manner! Tubachristmas music books (bass and treble clef, and large print bass clef) will be available to purchase if you do not have one for $20 a copy. Photocopies are a violation of copyright law and are illegal. The music is arranged for 4-6 parts on two staves so that it lays well for the instruments and is technically easy to play. Middle and Junior High School students can usually play their parts. Last year we had about 50 participants, some from more than 150 miles away. We hope to have more this year. Free registration will be given to the participant who has traveled the farthest distance to participate. Light refreshments will be provided for participants during registration. 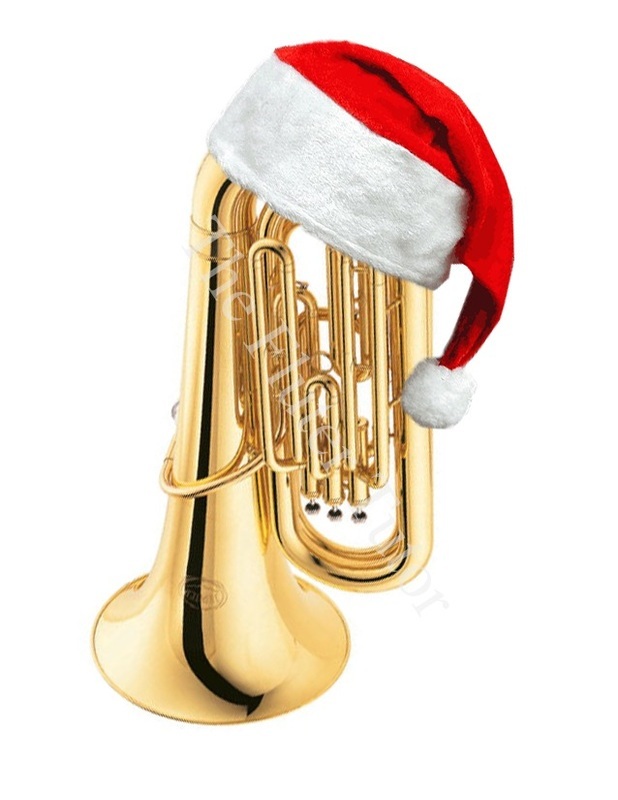 Tubachristmas hats, scarves, and recordings will be available for purchase. Additional Tubachristmas buttons will be available for $5.00 each. Tubachristmas in name and concept is a property of The Harvey Phillips Foundation, Inc., and commercial exploitation is strictly prohibited. If you have any questions feel free to contact me at (785) 532-5783 or via email at smaxwell@ksu.edu. I look forward to seeing you at Tubachristmas!